Eurokars Group has expanded its presence in the Asian region, with the opening of a Rolls-Royce Motor Cars dealership in Shanghai, China. 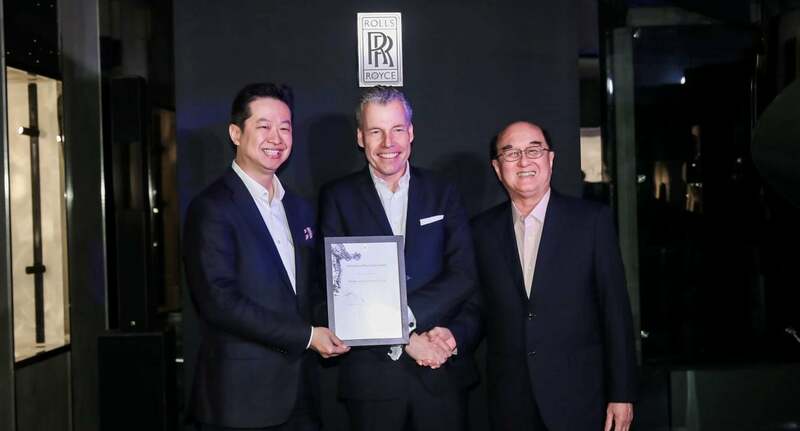 Located in Pudong, Shanghai, China, Rolls-Royce Motor Cars Shanghai EuroStar was officially opened on 21 March 2019 in an event that was attended by Senior Executives from Rolls-Royce Motor Cars including its Chief Executive Officer, Mr Torsten Müller-Ötvös; Mr Henrik Wilhelmsmeyer, Global Director of Sales and Marketing, and Mr Leon Li, Director of Rolls-Royce Motor Cars, the Greater China Region, as well as the investors of Rolls-Royce Motor Cars Shanghai EuroStar – Mr Karsono Kwee, Executive Chairman of Eurokars Group and Mr James Hartono, Founder of Shanghai Eurostar Co. Ltd.
“This new development augurs well for Eurokars Group, and marks the Group’s further foray into the dynamic and burgeoning China market. It complements our Rolls-Royce Motor Cars dealership in Nanning, China. And comes on the heels of the opening of the Eurokars Aftersales Centre – our new future-ready and integrated aftersales facility in Singapore – in October last year. Eurokars Group is sparing no efforts to future-proof its business and operations, and develop cutting-edge infrastructure and facilities to further propel its growth; enhance our luxury retail experience for all our customers, and embrace progressive new concepts in luxury. As a leading purveyor of premium and luxury automotive brands and retail experiences in the region, we will continue to innovate and tread new ground,” said Mr Kwee. The Rolls-Royce Motor Cars Shanghai EuroStar dealership has earned its honours by being the first in China to implement the brand’s new visual identity. It is also the abode of China’s first Rolls-Royce Boutique. This avant-garde, digital and innovative Boutique is a perfect embodiment of the leading luxury brand of Rolls-Royce. It is a new milestone for both the brand and the super luxury world for new retail experience. The new space speaks of Rolls-Royce’s commitment to effortlessly integrate itself into the lifestyles of its patrons. The Rolls-Royce Motor Cars luxury retail is centred on the client experience, allowing for the combination of both the physical space and the digital elements. The new showroom exudes innovation, modernity and luxury. The design and concept has evolved to focus on creating a luxury experience, taking cues from luxury retailers, while moving away from a traditional automotive environment towards a more innovative and dynamic environment supported by retail technologies and digital touchpoints. The Shanghai Boutique is also the first Rolls-Royce dealership to embody the brand’s new visual identity in China. The design of the new visual identity considers attention to detail and the use of high quality and luxurious materials in order to differentiate Rolls-Royce Motor Cars. There is a focus on creating a bespoke environment to stimulate bespoke ideas with clients, leading to an enhanced product offering. It establishes a state-of-the-art client centric retail experience to evolve the brand image and perception as forward looking, modern and youthful.